By Ed Semmler South Bend Tribune. SOUTH BEND — It was less than a decade ago that the half mile or so from Coveleski Stadium to the heart of downtown South Bend felt like a desolate stretch of mostly empty buildings and lots. 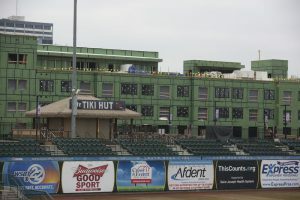 But that area’s revitalization is now evident in the millions of dollars in construction activity at the former Studebaker auto assembly complex along South Lafayette Boulevard, the Hibberd Building along South Main Street and the four new buildings that are rapidly taking shape around Four Winds Field. 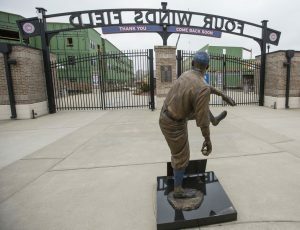 “We’re hoping this project helps close the gap between downtown and here,” said South Bend Cubs President Joe Hart who is overseeing construction of The Ivy at Berlin Place — a $22 million mixed-use project that will include 121 apartments as well as about 10,000 square-feet of restaurant/retail space. The South Bend Cubs are the Class A minor league baseball affiliate of the Chicago Cubs. 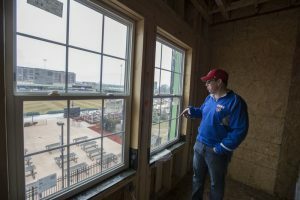 The first of the new three-story buildings will be ready for occupancy by July 20; it will include a two-bedroom apartment overlooking the outfield that’s already been taken by South Bend Cubs owner Andrew Berlin. That building also will feature a rooftop party deck that can be rented out for events and accommodate 300 guests. Reminiscent of the buildings surrounding Wrigley Field, the deck will include bleacher seating, a fire pit, a restaurant, bar and partial coverage by a pergola, among other things. “It will be like Wrigleyville, but we think nicer,” said Hart, adding that the deck should be available by the end of June and also will include entrance to the ballpark. 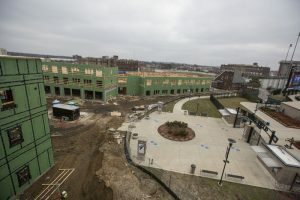 Hart said the three other buildings in the complex will open throughout the summer, and the project should be completed by the end of September. Many of the units will have views of the ballpark, and all will have access to a rooftop deck that will be built on a different unit. Indianapolis-based TWG, which is the project developer, will handle leasing of the unit and begin taking rental applications about 45 days before opening. So far the signs are positive. The units will have dedicated parking so there won’t be any problems for residents when there’s a home game or other special event at Four Winds Field. There also will be some covered parking available. Beyond the residential component, about 10,000 square-feet of street-level space is being reserved for what Berlin and Hart hope will be a convenience store and a restaurant. Those last two bits of information would be good news for other businesses that have made a commitment to the corridor. Sabrina Owens-Caballero, an administrative assistant at Xanatek Inc. at 412 S Lafayette Blvd., said those types of amenities are about the only thing missing in the area. Xanatek, which develops and maintains software for insurance companies, moved to its new location in June after years of leasing space in the core of downtown. The company has about 27 employees, but the new space gives the business room to grow. Sabrina Owens-Caballero also said she has not experienced any issues with the homeless community that is served next door at the Hope Rescue Mission, adding that panhandling seemed to more prevalent near the company’s former location. Hart also indicated that the city’s homeless population that tends to gather in nearby blocks has not effected the development plans. Beyond the store and restaurant that developers of The Ivy at Berlin Place hope to attract, Granger-based Bare Hands Brewery has plans to take over the former Gates Service Center at 331 W. Wayne St., and there have been rumors of more to come. None of it is a surprise to entrepreneur Kevin Smith, who operates several area businesses and is the driving force behind the massive overhaul of the Studebaker complex, including Building 84 — the long-abandoned six-story structure that has cast its substantial shadow over the area for decades. That eyesore — once a reminder of failure — is being converted into a new symbol of what we can become in the future, said Smith, who has spent millions of dollars and more than 30 years revamping Union Station and other nearby buildings and believes the complex eventually could support 3,000 jobs. The architectural and engineering firm Jones Petrie Rafinski has had offices in the near south side for nearly 15 years. The company’s first location was at 707 Scott St., and then it moved to the space now occupied by Xanatek in 2007. Last year, JPR completed an extensive overhaul of the long-vacant Schilling’s Camera building at 329 S. Lafayette Blvd. before making the short move to the new location. “We were across the street for about 10 years and just ran out of space,” said David Rafinski, vice president of the firm, which has about 40 employees at its South Bend office. JPR made a commitment to the near south side because it knew that the city had a long-term plan to bring life to the area and reconnect it to the core of downtown. The visions of Kevin Smith and Andrew Berlin have been key to the nascent revival of the area, said Rafinski. In fact, JPR led the redesign of Four Winds Field and that project helped it win additional stadium work in the United States and overseas. Among other things, the entrance to the stadium was flipped to point toward the northeast to create connectivity to downtown rather than a separate destination away from the core. Rafinski said he, too, would like to see a convenience store, restaurants, coffee shops and such locate in the corridor. Rafinski said the area is definitely on the upswing and could eventually become the place to be. “People’s perceptions are changing as the stadium continues to attract more people each year,” he said. In fact, attendance at the South Bend Cubs set an attendance record for the fourth consecutive year in 2017 by attracting just over 354,000 fans. And those numbers are expected to grow with the new deck and other improvements. Since he took over the team at the end of 2011, Berlin has invested about $33 million in ballpark improvements and the mixed-used project. Berlin also has an option for another parcel of property near the stadium, but Hart said there is no decision yet on the land. At this point, Hart has his hands full getting ready for the upcoming baseball season with an exhibition with Notre Dame scheduled for today and opening day of the Midwest League regular season set for Saturday (both weather permitting). “We think this can serve as a catalyst for additional development,” said Hart, who was surrounded by workers prepping the stadium for its opening as well as overseeing construction of the The Ivy project.